Co. Mayo: Ballycastle, Beldergmore, East Kilfian, South Kilfian, West Kilfian, Killala, North Lachan, South Lachan. The Guardians met on alternate Saturdays. 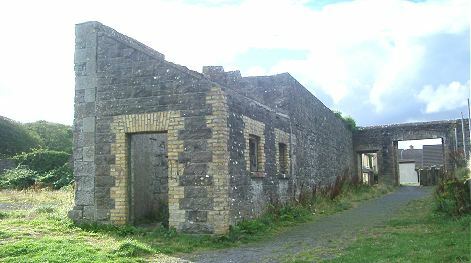 The new Killala Union workhouse was erected on a six-acre site at the south-east of Killala. Designed by the Poor Law Commissioners' architect George Wilkinson, the building could accommodate 500 inmates. Its construction cost £4,500 plus £885 for fittings etc. The workhouse site location and layout are shown on the 1890s OS map below. The design was broadly similar in size and layout to workhouses such as those at Claremorris and Newport which were built at around the same time. However, it appears to have lacked the two long blocks that usually flanked the entrance. The main building had a T-shaped layout. The central wing running towards the east was probably a single-storey block containing the dining-hall and kitchens. To each side were accommodation wings, one for men and one for women. A small fever hospital was located at the south of the site. In 1917, the Killala union was dissolved and amalgamated with the neighbouring Ballina union. The former workhouse site is now occupied by a housing development. 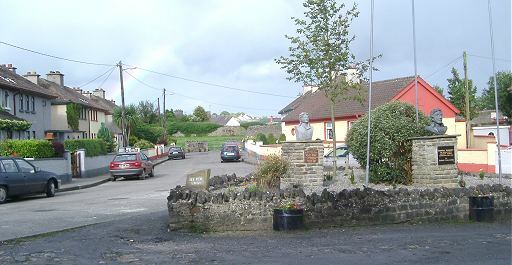 Killala former workhouse site from the east, 2003. A derelict stucture stands at the south-west of the site, at about the location of the workhouse fever hospital. Killala former workhouse site (fever hospital?) from the north-west, 2003.